eGuide to Ronda - Clarinda Parques S.L. Ronda is one of the oldest cities of Spain.Its origin, according to archaelogical findings in the old city space belongs to the Neolithic age. Despite of this, the presence of the human being in this land can be explained at a previous time. A proof of this are the sites found at caves, being the most important the one found at the Pileta's Cave, which is one of the best cave's paintings examples of all the Paleolithic age in Andalusia. During the recent Prehistory a lot of human settlements are founded. This fact is proofed by the existance and conservation through the time of archaeological rests that can still be admired nowadays, being represented by some of its most relevant and monumental artistic examples, like the megalithic Necropolis: Dolmen of El Chopo and Encinas Borrachas among others. It will be also at that time when the most important human settlements of the region will be well defined: Acinipo and Ronda, but its rise and important time will arrive later. The time of Acinipo will be at the Roman Empire Age and the Ronda time will be at the Middle Age. From the Roman conquest time of the Iberian Peninsula still remain at our region a lot of rests, being important the ones found in the same city of Ronda. But, without any kind of doubts, the most important archaeological site of the region is the Roman city of Acinipo, because of its conservation's state and also because of some of its elements belonging to a Classic Roman city, like for example, the Theater. Once that Acinipo dissapeared, and after the convulsive period which reason is the Fall of the Roman Empire, the attention was paid now to the city of Ronda. That city, although being a small settlement even during the first time of the Middle Age, became since then the main place where all the important historic events happened. Among these historic events, and because of its importance and its cultural legacy, still alive at the common life (town planning, gastronomy,traditions, farming systems, etc.) has to be considered the Arab Age as the most important. At that time, Ronda appears to be as one of the leading cities, arriving to the category of main city of one of the Kuras (Provinces) of Al-Andalus (the province of Ronda was named of Takurunna). Ronda even achieved to be independent as an independent Kingdom (called at that age the Taifas Kingdom) after the fall of the Cordoba Kingdom. 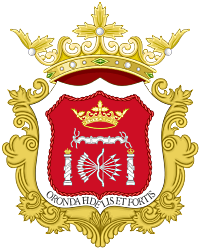 The most important character played by Ronda, and the reason for being well known, arrives with the Nazari Kingdom of Granada, because of its closeness to the territories conquered by the Catholics coming from Castilla. That leads to the city of Ronda, as well to its region, to be a very important border zone. After the conquest of the city by the Catholic Monarchs(1485) deep economic and cultural changes happened, which can be still seen at the structure of the city: Opening of squares not existing before, streets made broader, etc. The 18th century, and the arrival of the Modern age, will be for Ronda the time when it will get its definitive role inside the land of Andalusia. At that time, the most relevant and known monuments of the city where built, as signs of the former aristocracy and the present Ronda: The New Bridge and the Bullring. Since that time and during the 19th century, the romantic image of the city grows, as well as the legend of its Serrania (mountains), generating the world of the bandits and the art of bullfighting a deep impression between lots of important travellers. Both aspects have been converted since then into symbols of our culture and tradition. Despite of this, the cultural and traditional richness of Ronda is much wider and diverse that the one offered by this image, cliched although being nice. This diversity is the current attraction of Ronda and its Serrania. Here are just some ideas from the InspriRock Tours website. But you don't always need an official guide. The Tourist Office beside the Bullring has ample maps and guides. Explore the heart of one of Spain's most distinctive destinations as you wander through Old City. Ronda's historical neighborhood boasts dramatic scenery, desirable views over the nearby valley, and a host of well-preserved historical architecture. Saunter across the high-arched bridge, admire churches dating as far back as the 9th century, and enjoy a coffee at a buzzing plaza. 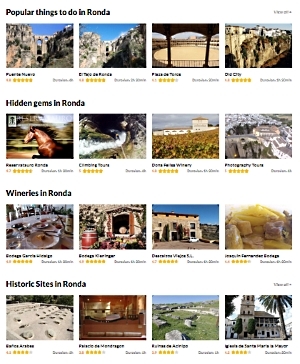 Add Old City and other attractions to your Ronda trip itinerary using our Ronda day trip planner . Baños Arabes is located in Ronda. With our international travel planner, Ronda attractions like Baños Arabes can be center stage of your vacation plans, and you can find out about other attractions like it, unlike it, near it, and miles away. Built in 1314, Palacio de Mondragon was erected for royalty, and is filled with Mudejar features and decor. During your visit, you will see Mudejar ceilings, doors, windows, ceramic tile, pillars, mosaics, balconies, and more. The garden overlooking the gorge is a highlight of the site. There are also exhibits throughout the building about the history of the town and its surroundings. English translations are provided but are sometimes cryptic, so consider researching the attraction before you go. See Palacio de Mondragon and all Ronda has to offer by arranging your trip with our Ronda trip app . Ruinas de Acinipo is located in Ronda. 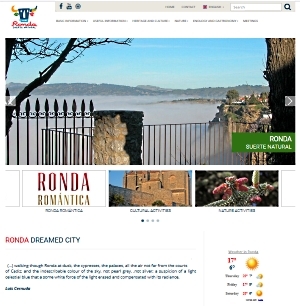 Using our online itinerary creator, Ronda attractions like Ruinas de Acinipo can form part of a personalized travel itinerary. Iglesia de Santa Maria la Mayor is located in Ronda. Using our custom trip planner, Ronda attractions like Iglesia de Santa Maria la Mayor can form part of a personalized travel itinerary. More info about travel to Andalucía: http://www.ricksteves.com/europe/spai... Spaniards know Ronda, one of the White Hill Towns of Andalucía, as the cradle of modern bullfighting and for its stunning cliffside location. Strolling the back streets, you feel a strong local pride and sense of community where mingling over delicious tapas is a time-honored tradition. At http://www.ricksteves.com, you'll find money-saving travel tips, small-group tours, guidebooks, TV shows, radio programs, podcasts, and more on this destination. Rilke called Ronda "the City of Dreams". Ernest Hemingway and Orson Welles also fell in love with it. The views of El Tajo gorge from both the New and the Old Bridge are impressive. Moreover, Ronda is brimming with interesting sights: the Old Theatre Walls, the Roman site of Acinipo, the modern Bullring, and more. This is Ronda and Serranía.